1760 ~ 1780: born in Kamigata. His father is the katakiyaku actor Ichikawa Ikuzô and his master the tachiyaku actor Nakayama Bunshichi I. He is trained as a wakaonnagata. 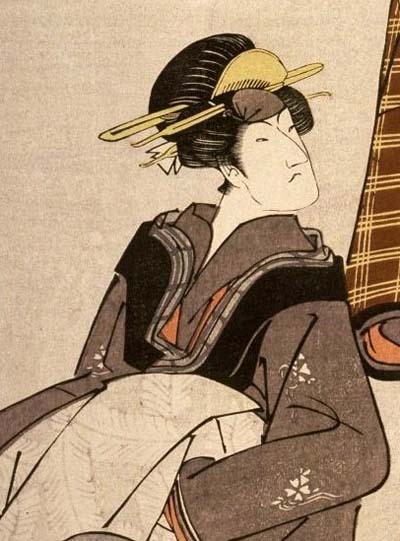 Fall 1780: Ichikawa Ikuzô and his son Tomisaburô go together to Edo. 9th lunar month of 1790: the play "Yoshitsune Koshigoejô" is staged for the first time in Edo, at the Ichimuraza; it celebrates the onagori kyôgen of the Kamigata star Asao Tamejûrô I; Tomisaburô plays the role of Gotobê's wife Sekijo [more details]. 1st lunar month of 1796: premiere at the Kiriza of Namiki Gohei I's drama "Suda no Haru Geisha Katagi"; Tomisaburô plays the role of Okimi [casting]. 1st lunar month of 1798: Tomisaburô's rank in the Edo hyôbanki, wakaonnagata section, is jô-jô-kichi (superior - superior - excellent). He shares this rank with Nakamura Noshio II. 15th day of the 6th lunar month of 1798: his father Ichikawa Ikuzô dies. 11th lunar month of 1799: Tomisaburô plays at the Nakamuraza in the kaomise drama "Tametomo Yumiya no Oyafune", which celebrates the shûmei of Bandô Mitsugorô III. 1st lunar month of 1800: Tomisaburô's rank in the Edo hyôbanki, wakaonnagata section, falls one stroke below jô-jô-kichi (superior - superior - excellent). 5th lunar month of 1800: Tomisaburô plays at the Nakamuraza the roles of Shizuka Gozen and Suke-no-Tsubone in the drama "Yoshitsune Senbon Zakura". 11th lunar month of 1801: Tomisaburô plays at the Nakamuraza in the kaomise drama "Date Dôgutsui no Ôtori", which celebrates the shûmei of Bandô Hikozaemon I and Yamashita Mansaku. 1st lunar month of 1802: Tomisaburô's rank in the Edo hyôbanki, wakaonnagata section, is back to jô-jô-kichi (superior - superior - excellent). 3rd lunar month of 1802: Tomisaburô plays in the same theater the role of the courtesan Agemaki in the drama "Sukeroku Yukari no Edo Zakura"; the roles of Sukeroku and Ikyû are played by Ichikawa Yaozô III and Onoe Matsusuke I. He also plays the roles of Yae and Tonami in the drama "Sugawara Denju Tenarai Kagami". 8th lunar month of 1802: Tomisaburô plays at the Nakamuraza the roles of Sasao and Otani in the drama "Igagoe Norikake Gappa". 11th lunar month of 1802: Tomisaburô plays at the Nakamuraza in the kaomise drama "Koshiji no Hana Oedo no Torideki". 8th lunar month of 1803: premiere at the Nakamuraza of Sakurada Jisuke I's drama "Banzui Chôbê Shôjin Manaita"; Tomisaburô plays the role of Komurasaki [casting]. 11th lunar month of 1803: Tomisaburô moves to the Kawarasakiza and plays in the kaomise drama "Yamato Nishiki Yoshino Dairi", which includes the "Onna Shibaraku" scene [print]. 1st lunar month of 1804: Tomisaburô's rank in the Edo hyôbanki, wakaonnagata section, falls one stroke below jô-jô-kichi (superior - superior - excellent). 9th lunar month of 1804: Tomisaburô plays in the same theater the roles of Okaru, Rikiya and Tonase in the drama "Kanadehon Chûshingura". 11th lunar month of 1804: Tomisaburô plays at the Kawarasakiza in the kaomise drama "Shitennô Momiji no Edoguma", which welcomes in Edo the Kamigata actor Arashi Danpachi. 1st lunar month of 1805: Tomisaburô's rank in the Edo hyôbanki, wakaonnagata section, is back to jô-jô-kichi (superior - superior - excellent). 3rd lunar month of 1805: Tomisaburô plays in the same theater the role of Ohatsu in the drama "Kagamiyama Kokyô no Nishikie"; the roles of Onoe and Iwafuji are played by Osagawa Tsuneyo II and Onoe Matsusuke I. Tomisaburô also plays the role of the courtesan Agemaki in the drama "Sukeroku Yukari no Edo Zakura", which is staged to commemorate the 6th anniversary (7th memorial service) of late Ichikawa Danjûrô VI; the roles of Sukeroku and Ikyû are played by Ichikawa Omezô I and Onoe Matsusuke I. 11th lunar month of 1805: Tomisaburô moves to the Ichimuraza and plays in the kaomise drama "Keisei Yoshino no Kane". 4th lunar month of 1806: Tomisaburô plays in the same theater the roles of Tonase and Osono in the drama "Kanadehon Chûshingura". Winter 1807: Tomisaburô goes to Kyôto. 3rd lunar month of 1807: Tomisaburô plays in Kyôto at the Kitagawa no Shibai the roles of Miyako and Oseki in the drama "Futatsu Chôchô Kuruwa Nikki". 5th lunar month of 1807: Tomisaburô plays in the same theater the role of Enju in the drama "Hirakana Seisuiki". 7th lunar month of 1807: Tomisaburô plays in the same theater the role of Shizuka Gozen in the drama "Yoshitsune Senbon Zakura". 11th lunar month of 1807: Tomisaburô goes to Ôsaka and plays at the Kado no Shibai the role of Omino in the drama "Hikeyahike Nishikiguruma". 1st lunar month of 1808: Tomisaburô's rank in the Kamigata hyôbanki, wakaonnagata section, is jô-jô-kichi (superior - superior - excellent). 6th lunar month of 1808: tour in Nagoya for a troupe led by Kataoka Nizaemon VII, Tomisaburô, Ogino Izaburô II, Ichikawa Ichizô I, Nakayama Bungorô I and Ichikawa Yaozô IV; they perform at the Tachibana no Shibai in dramas like "Keisei Takasago no Matsu", "Futa Meoto Sarashi no Hinagata" or "Azuma Kagami Mikari no Maki". 8th lunar month of 1808: Tomisaburô is back in Ôsaka to perform at the Kado no Shibai. 11th lunar month of 1808: Tomisaburô plays at the Minamigawa no Shibai the role of Sanai's wife in the kaomise drama "Koi Nyôbô Somewake Tazuna". He also plays the role of Akoya in "Dan no Ura Kabuto Gunki"; his stage partners are Nakayama Bunshichi III (Shigetada) and Kataoka Nizaemon VII (Iwanaga Saemon). 10th lunar month of 1809: Tomisaburô plays at the Naka no Shibai the role of the courtesan Yûgiri in the drama "Awa no Naruto". Fall 1810: Tomisaburô goes to Edo, with Onoe Shinshichi II and Nakayama Kamesaburô. 11th lunar month of 1810: Tomisaburô plays at the Moritaza in the kaomise drama "Monomi Guruma Yuki no Takadono". 4th lunar month of 1811: Tomisaburô plays in the same theater the roles of Kaoyo Gozen, Okaru and Tonase in the drama "Kanadehon Chûshingura". 11th lunar month of 1813: Tomisaburô plays at the Moritaza in the kaomise drama "Gohiiki Tsunagi Uma". This is his last kaomise; Tomisaburô does not retire but his appearances on stage become rare. 2nd lunar month of 1818: Tomisaburô appears on stage for the last time, playing at the Nakamuraza in the drama "Kamakura Sandaiki". 10th day of the 9th lunar month of 1819: Tomisaburô dies in Edo. Nakayama Tomisaburô I, who was born and trained in Kamigata, achieved fame from himself in Edo from the end of the 1790s to the beginning of the 1810s. He was said to be better in sewamono than in jidaimono, excelling in keisei and sewa nyôbô roles.